Leuke houten huisjes. Mooi ingericht. 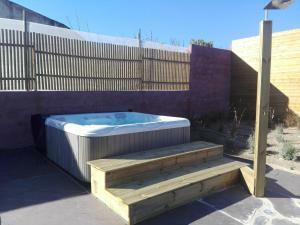 Jacuzzi top! Gezellige, leuke houten appartementen; heerlijk ontbijt inbegrepen in je eigen appartement. Zeer vriendelijke gastheer/vrouw. Heerlijke zwembad en bubbelbad. Ook recent wasmachine op lokatie toegevoegd, zeer praktisch. Prima lokatie om omgeving te verkennen. Breakfast was fabulous, hosts were extremely friendly and the location was superb. Beds were very comfortable. Extra information emailed about the surrounding area on arrival. It was excellent! We have to thank the tremendous hospitality from all of the staff. The jacuzzi in the winter is a must. The accommodations are top-notch and there is care with all the details. We came with friends and the kids and the region is filled with interesting activities. We are definitely coming back. The breakfasts were delicious, the facilities were excellent and everywhere was clean and well maintained. The hosts were extremely helpful and friendly. A very enjoyable stay. New, modern, cozy and clean facility. Swimming pool in the central part, quite place and very nice staff. Tasty and fresh breakfast provided every morning directly to the house. Happy to recommend and thank you! The staff were very polite, they severed an excellent breakfast, and the area is very quiet and relaxing. The house was very clean and practical. Gostamos de tudo , mas sem duvida que a tranquilidade do local e o facto de termos todas as condições necessárias para quem tem crianças pequenas foi muito bom ! As vilas são simples mas com uma decoração excepcional! Verzeker uzelf van een geweldige prijs voor Óbidos Wood Villas - door recente gasten met een 9,4 beoordeeld. 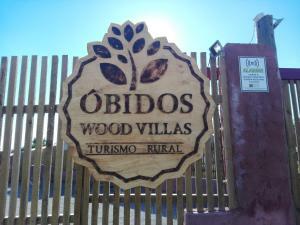 Óbidos Wood Villas ligt in Olho Marinho. Deze accommodatie biedt toegang tot een patio. Het vakantiehuis met 2 slaapkamers beschikt over een keuken met een vaatwasser en 1 badkamer met een douche. Er is ook een flatscreen-tv met kabelzenders aanwezig. Het vakantiehuis beschikt over een hot tub. In de omgeving kunt u fietsen en wandelen. Óbidos ligt op 10 km van Óbidos Wood Villas en Peniche ligt op 16 km van de accommodatie. De dichtstbijzijnde luchthaven is Humberto Delgado, op 85 km van de accommodatie, en de accommodatie biedt tegen een toeslag een pendeldienst van/naar de luchthaven. Deze accommodatie heeft ook een van de best beoordeelde locaties in Olho Marinho! Gasten geven het een hogere score dan aan andere accommodaties in de buurt. Deze accommodatie scoort ook het beste op prijs/kwaliteitverhouding in Olho Marinho! Gasten krijgen meer voor hun geld ten opzichte van andere accommodaties in deze stad. Óbidos Wood Villas verwelkomt gasten van Booking.com sinds 17 dec 2016. Wanneer wilt u verblijven in Óbidos Wood Villas? Dit vakantiehuis heeft thee- en koffiefaciliteiten, keukengerei en een eethoek. 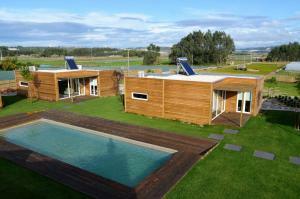 ÓBIDOS WOOD VILLAS is a Rural Tourism unit with an innovative concept in the West region. 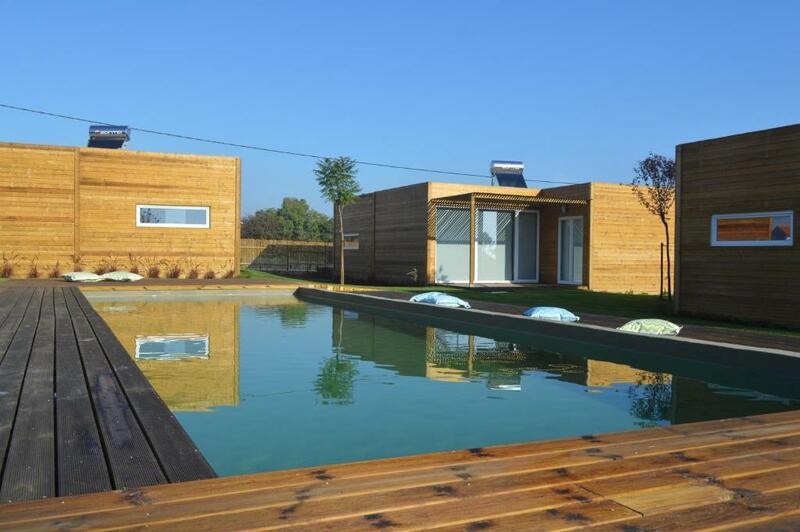 With a modern, simple and ecological construction, it harmoniously combines the comfort of the wood with the rural landscape where it is located. The four Villas with T2 typology, ideal for families or groups of friends, offers several facilities that will make you feel at home. The unit also consists of a reception, swimming pool and a jacuzzi and also offers bicycles. 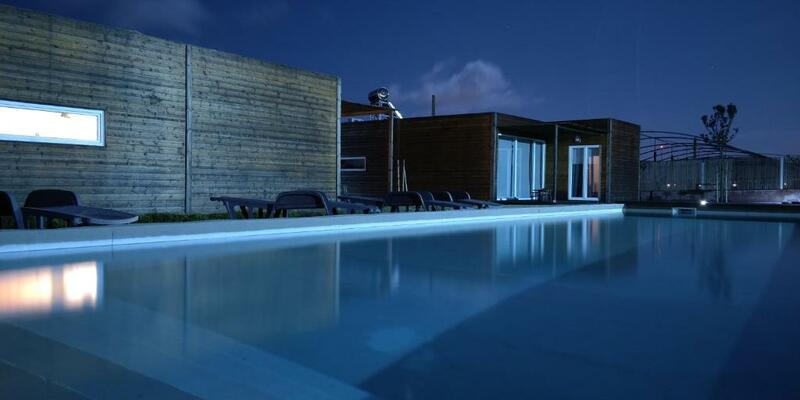 Located in Olho Marinho, 10 km from Óbidos and 15 km from Peniche, ÓBIDOS WOOD VILLAS presents a privileged location for those who want to explore the region or simply enjoy a few days of rest. 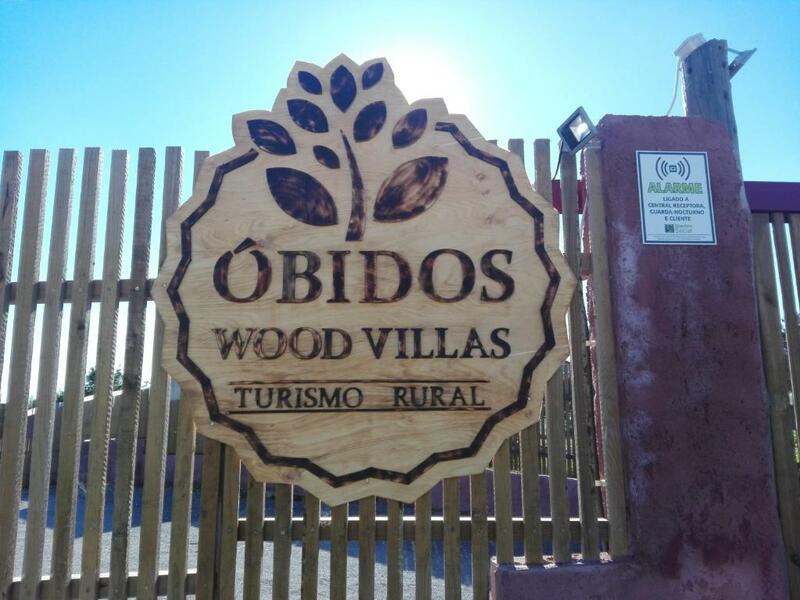 ÓBIDOS WOOD VILLAS was born from a family project. Hélder and Sandrina, owners of this unit, wanted to create a space where well-being and comfort were in harmony with nature. After some trips and experiences, they concluded that the ideal when you are on vacation with family or friends, is to find a place that provides the comfort of home with the services of a hotel. A place that allows you to discover and explore the region, but at the end of the day you can return to take a dive into the swimming pool. A place without confusion and without haste where there is time to read a book and listen to the nature. In the middle of a rural area, in a region with an historical and environmental heritage as rich as the West, they decided to share experiences that only with the people of the land can be achieved. The project, which was entirely conceived by the owners, had the involvement of these at every stage. 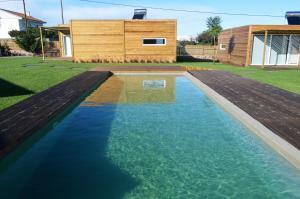 The materials used in the construction were chosen based on an eco-friendly criteria, with wood being the main element. Part of the furniture, made by the owner's own hands, is based on the reuse of the wood used in the construction of the Villas. 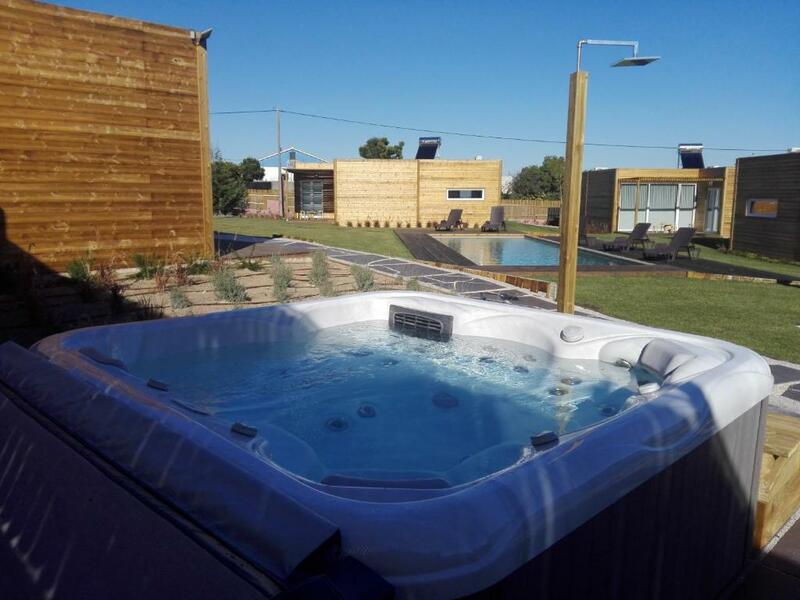 Huisregels Óbidos Wood Villas accepteert speciale verzoeken, voeg ze toe bij de volgende stap! Alles netjes voor elkaar !